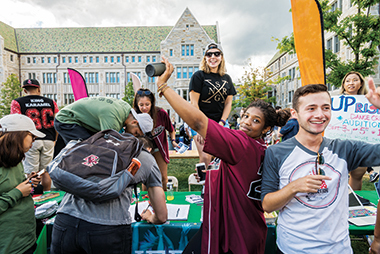 For five hours on September 2, representatives of some 260 student clubs and University offices and programs assembled on Stokes Lawn, as they do each fall, for the Student Involvement Fair, to court new members from among freshman and returning students. Standing behind (or sometimes atop) folding tables decked out with laptops, sign-up sheets, candy, and eponymous swag (T-shirts, bracelets, pens, coffee cups), they made their pitches under changeable skies—a classic start-of-fall day. 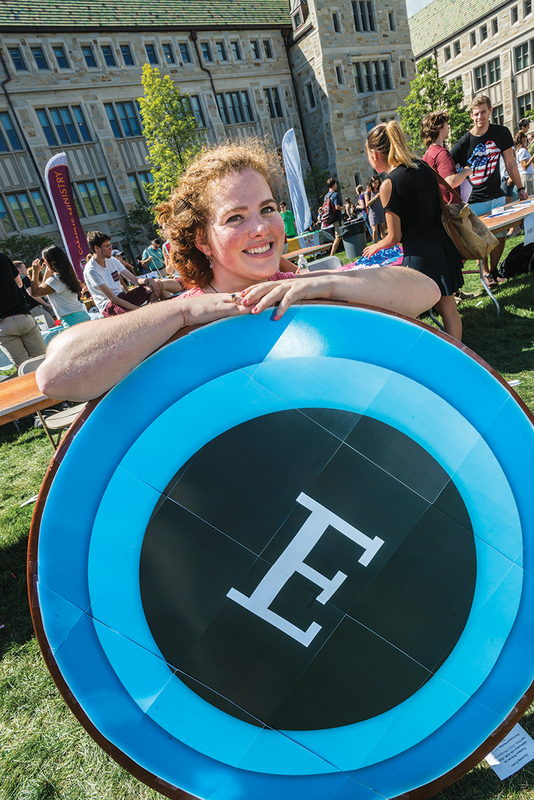 On hand were 36 music, studio art, and performance groups (including the University Chorale, Anime of Boston College, and Ready, Set, PUNCHLINE! ); 27 club sports (field hockey, women’s water polo, men’s volleyball); 24 intercultural groups (Asian Caucus, Black Student Forum, German Academy); 25 academic and pre-professional organizations (the Society of Physics Students, AHANA Pre-Law Student Association, and Student Nurses Association); and 30 special interest groups (including the Outdoor Club, Dui-Hua Chinese Dialogue Club, and Students for Education Reform). Campus Ministry was there, offering 26 programs, from the Mississippi Delta winter service trip to the Buddhism Club. 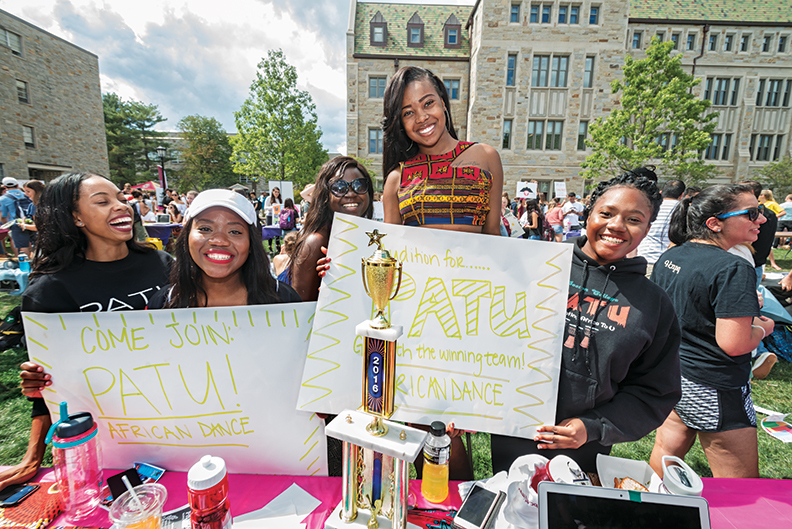 The fair is sponsored by the Office of Student Involvement, which also registers student groups, entitling them to University funding (the average grant is between $3,000 and $4,000) and the right to reserve spaces such as classrooms and rehearsal studios. 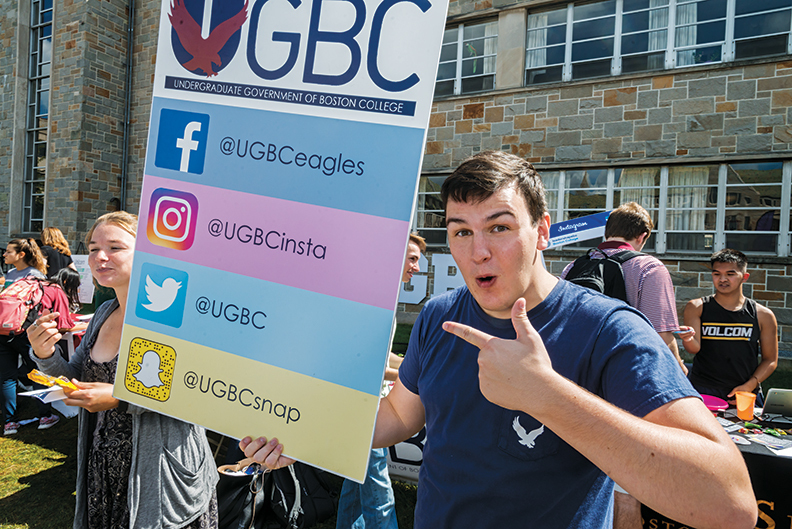 Registered student groups receive training in how to manage finances, organize events, and plan for leadership transitions. 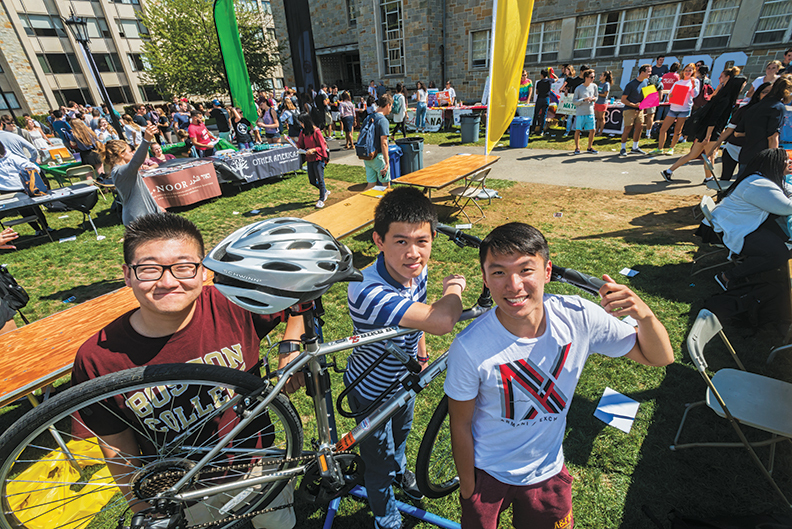 More than 3,000 undergraduates visited the fair. How many signed up—and for how many groups—is not known. 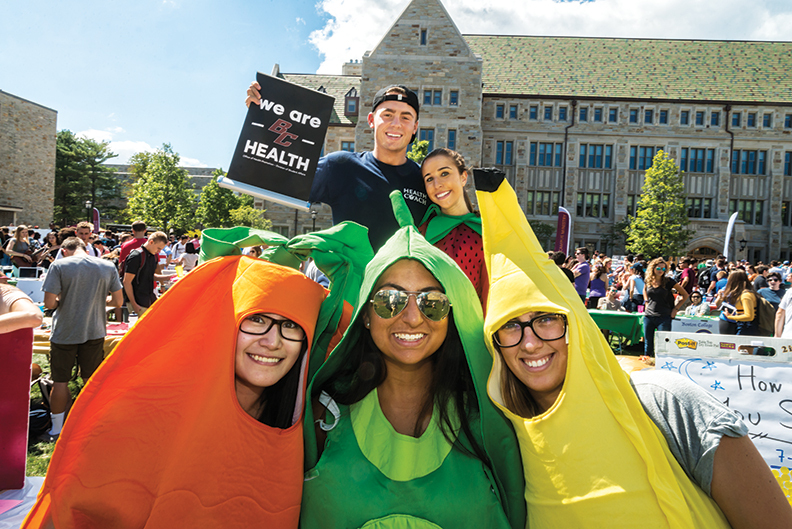 In spring 2015, 88 percent of respondents to a senior class survey said they had been an active member of at least one student club or organization. Anthony Perasso ’17 (carbon-fiber oar in hand) talks up the men’s crew team. “Join the Appalachia Volunteers!” “My Mother’s Fleabag tryouts are next week!” “UGBC wants you!”—so go the cries. Heights staffers wave newspapers. Members of the Campus Activities Board sport matching quarter-zips. And the men’s step team performs an impromptu routine. 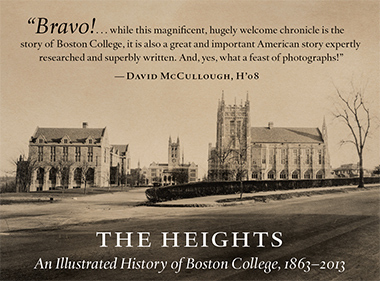 I knew nothing about rowing when I arrived at Boston College. The only exposure I’d had to it was through watching The Social Network, in which Mark Zuckerberg’s arch competitors, the Winklevoss twins, are members of the Harvard crew team. I’d played football in high school, though. And I wanted to be on a team. Men’s crew at Boston College works this way. You wake up very early six days a week, run, bike, or catch a two-mile ride to the boathouse at the bottom edge of Brighton, beside the Charles River; then you row downstream in sunshine, rain, or snow, past Fenway Park and BU, turn the shell around, row upstream, and make your way back to campus (uphill, this time) for a communal breakfast in Corcoran Commons. When the river freezes, you work out indoors. During the competition season you row on rivers from New Hampshire to Georgia, against varsity as well as club teams. You do this for four years. You make friends. 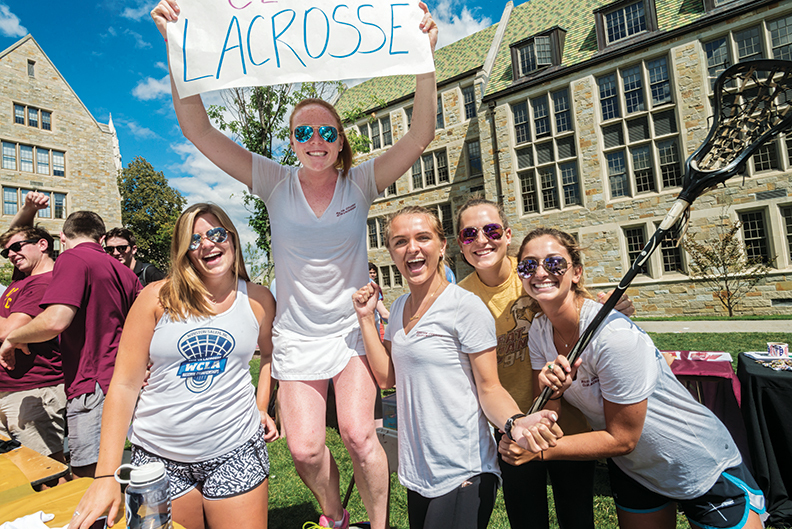 A few of those friends—including my roommate—are with me at the table on Stokes Lawn as a freshman approaches. He’s wearing a T-shirt that indicates he ran cross-country in high school. It’s a good sign. He asks the usual questions. Previous experience isn’t necessary, I answer. Yes, it’s fairly easy to learn if you’re dedicated. Yes, practice is early in the morning, but it adds structure to your life, and the breakfast makes it all worthwhile. So, what you’re going to want to do, I say, is put your name and email on the spreadsheet on this laptop, and we’ll send you details about the informational meeting that’s coming up. 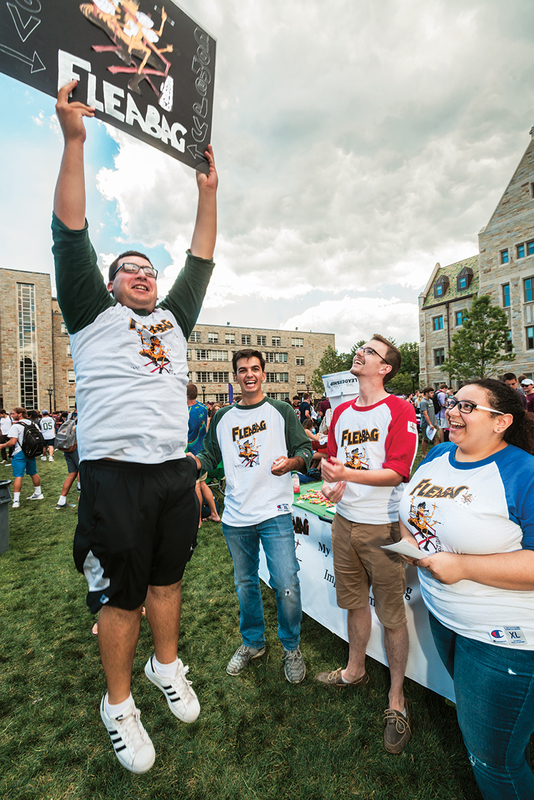 Two hundred and seventy freshmen sign in on Stokes Lawn. About 80 show up at the meeting. Forty come to the first workout. About 20 will make the roster. Some number of them will be friends at Boston College, and some number will be friends for life.